April 12, 2019 Excavators have set up next to Kevin’s watery grave. 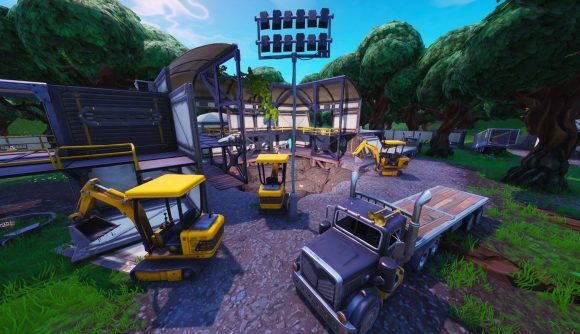 Fortnite’s dig sites have served as one of the big ongoing mysteries for the season, and we still don’t know what the mysterious excavators are looking for. The latest dig site might give us a clue, though – a bunch of excavators have lined up at Loot Lake, where Kevin the cube exploded and descended into the water all those months ago. Last month, Fortnite players discovered an excavation site towards the south-east corner of the battle royale’s map. The rocks in the original dig site had 100,000,000 hit points, and required players to work together over several days to clear them. More sites appeared, but it didn’t take long before players had emptied them all, uncovering first treasure troves and then pools of lava. More recently, players discovered that all of their hard work had been undone. Overnight, Epic had filled in every single site, replenishing each rock back to 100 million health. There’s been no concrete info on Fortnite Season 9 yet, but this change feels like it could be the next step on the journey. Fortnite players don’t seem best pleased that their hard work has been undone, but hopefully they’ll have something to show for their efforts in the not too distant future. Elsewhere in Fortnite, the arrival of the latest patch has finally introduced the long-awaited Reboot Vans to the game. The new additions have been a long time coming, but now offer players the chance to bring their dear-departed teammates back to life.